Personal Details: May was the youngest daughter of Mr. Harold Francis Saville and Mrs Jessie Saville (nee Weston). May had an older sister, Patricia Annie Velma Saville (known as Pat, later Pat Anderson, born 14th of April 1920), a younger sister Alice Elizabeth Saville (known as Mick, later Alice Cotter, born 20 October 1921), and a younger brother Douglas George Samuel Saville (known as Bunty, born 26 March 1928). Born in Te Awamutu, and shifting about a bit when young, May grew up mainly in Te Kuiti attending Te Kuiti Primary School, and then she went to the Catholic School there to learn Commercial, despite being a member of the Church of England faith. May moved to Cambridge with her parents and siblings when she was in her late teens. The family lived at 3 Thornton Road, Cambridge. May's parents owned and ran a tea rooms upstairs in the Triangle building in the main shopping area of Cambridge, and before joining the WAAF, May worked there with them. May recalls, "They had a tearoom in Cambridge. Up on the Triangle, down the bottom of the street, and that was on the second floor." The upstairs premises that may refers to is currently (2015) occupied by an insurance company. And the cafe 'Deli On The Corner' is downstairs. may recalls the work there, "Yeah, I was serving I think, a bit of everything, with Mum and Dad." When asked if working in the tea rooms was a good life, May responded, "Oh... lovely! My Dad wasn't very well, and of course he died while he was there, which was sad. And we didn't like that one bit." Service Details: May joined the Air Force when she turned 18 in 1942. 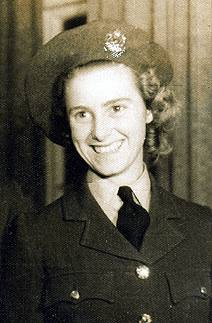 Her elder sister Pat Saville joined the WAAF at the same time as May. 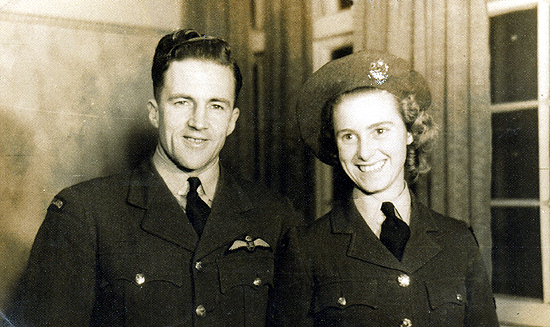 The pair joined up at the RNZAF Recruiting Office in Victoria Street, Hamilton. May recalls how simple it seemed to be to join, "Well yes, they asked if we were fit, and we said yes. So some doctor took a look at us, and we were, so we went. We just got call up papers, and that was it." They were both sent to RNZAF Station Whenuapai. May remembers their arrival, "We were marched in, all in our civvies, down to the Clothing Store. We were given a pair of shoes, i think, and measured for uniforms. But it took ages before they came. And we sort of tottered around a bit." Searching her memory, May says, "Now what in earth did I do when i first went there? I must have gone to the Airmens Mess, I think. One horrible thing they did do to us though, they gave us inoculations." Rolling up her sleeve and looking at her arm, "I don't know where my mark has gone now, but it was there for a long, long time. And it made us feel so sick - something I do remember!" May became a Mess Hand in the Airmen's Mess, while Pat became a Physical Training Instructor. May says, "We were lucky enough to stay together for a long time. But then of course she was posted away." From the Airmen's Mess, May transferred to work on the Officers' Mess. Following this came quite a change, as she recalls, "And at one stage I even managed to get into the Control Tower, which was really good fun. Talking to the aeroplanes, getting them to land, or take off, or do whatever. Amazing life, you know. It was the most wonderful -- terrible thing to say -- but it was a wonderful war. We had so much fun, it was lovely." "We were given a house to live in, and all the other WAAF's. Well, we left the barracks and were given this house to live in. I don't know why, it just happened I suppose. You just go with the flow, don't you? We had bedrooms, well every room was a bedroom with beds and wardrobes in it, so you had your little place. And we made some lovely friends. I wonder where they all are, well I'm getting so old now they have probably all departed this mortal coil, eh?" Trying to recall the other WAAF's she shared the house with, May struggles, " There was Viv Taylor... oh no.... in the middle of the night tonight I'll think 'I know who they all were in our room'..."
She does recall the "Queen Bee" head WAAF who looked after all the girls on the station, "Yeah, Brackenridge, wasn't it? Somebody Brackenridge, or Brackenbridge - one of the two." When asked if she was an old battle axe, May says, "well, it all depends where you met her. If you met her at a social function, very nice. But if you met her at work, or if you were misbehaving and were 'on the mat' it wasn't very good. No. I think one time I gave some cheek to the Queen Bee at the Mess, where we worked, and she said I was insolent. And she reported me for that, too bad! So i had to go and see this Brackenbridge lady, and oh, I couldn't believe it. Fancy reporting someone for being insolent. Now that's plain silly, isn't it? You just grin and bear it, and say don't do it again." On reflection of the childishness of it all, May says, "Well of course, we weren't very old, were we." Smiling, she adds, " But I don't think I am very insolent. I mind my manners these days." Remembering life on station, May says, "You went to work in the morning, worked all day, had dinner and went home and went to sleep mostly. Oh yes, we had lovely dances. That's where I met Max, of course, at the dance - they all used to come." May got to know a lot of the men who were on the various operational squadrons based at Whenuapai. "Oh yes. My sister met her husband there, she was Pat Anderson, in the finish. Well of course I can't remember all the people. We had little groups that all hung out together, you know. We'd go down to the YMCA after work, and have a cup of tea, and a cigarette." She emphasises the last word as if they were all very naughty. "I don't smoke now! It's a silly thing to do. But everybody did, it was just the thing to do. Especially when the Americans came and we were given American cigarettes, we loved them! Yeah, they were very nice." The WAAF's got off the station as often as possible too. "We used to go into Queen Street, to the movies, and run like heck down Queen Street to get the bus at half past ten! Lovely, going to the movies. And i think we went to the Winter Gardens, to the dances. I remember, they were down underneath the Civic Theatre. Auckland was lovely in those days." May's father Harold passed away on the 28th of April 1944. May was still a WAAF in June 1944 when her engagement notice was published, but she must have left the Air Force shortly afterwards. Connection with Cambridge: May moved to Cambridge in her teens and worked in her parents' tearooms, before she joined the WAAF.